Gunsbet casino is one of our new favourite gambling destinations. Why? Between many reasons, we can mention a great – yet simple web design, multiple software platform, instant withdrawals, variety of payment methods, and yes, it works with Bitcoin. 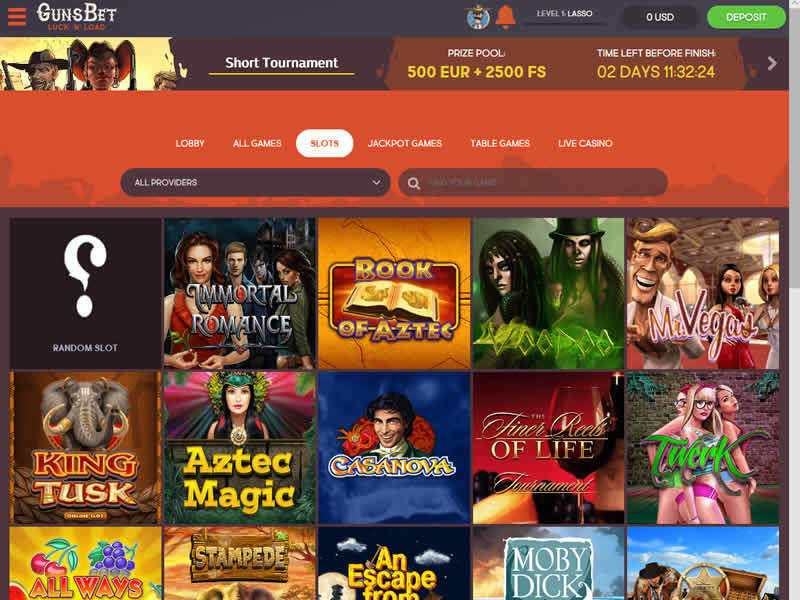 This online casino was launched in 2017, under NetIncom N.V. management. While it accepts players from around the globe, you will not be able to place real money bets if you live in USA, UK, Spain or France. Good news for the ones looking for Australia Casinos: Gunsbet accepts Australian players and pays faster than other regional brands. Withdrawals are processed in 2 to 24hs and aussies can also enjoy speedy cash outs. That’s quite a rare thing to find in this market and definitely a big plus. On the downside, this casino owns a license Curacao, but the fact that is also certified by eCOGRA and IBAs confirms Gunsbet casino is proven safe and fair. After going over this casino review, you will have all the information you need to decide if this venue is right for you. You will be happy to know that Gunsbet offers instant withdrawals and multiple banking methods. Limits are set on $/€ 4,000 / 6,000 and 15,000 per transaction, week and month, respectively. While this is an average rate, European casinos usually offer wider withdrawal limits. Hopefully, Gunsbet will pay attention to players feedback and improve them soon. Gunsbet casino accepts the following currencies: EUR, USD, CAD, AUD, SEK, NOK, RUB, PLN, NZD and BTC. The registration form is quite simple as well as the verification. We recommend to upload all documents required as soon as possible, to avoid delays in processing. To be honest, bonus offers are not Gunsbet strongest point. You will find a couple of match bonuses that involve high wagering requirements, some reloads and VIP specials. 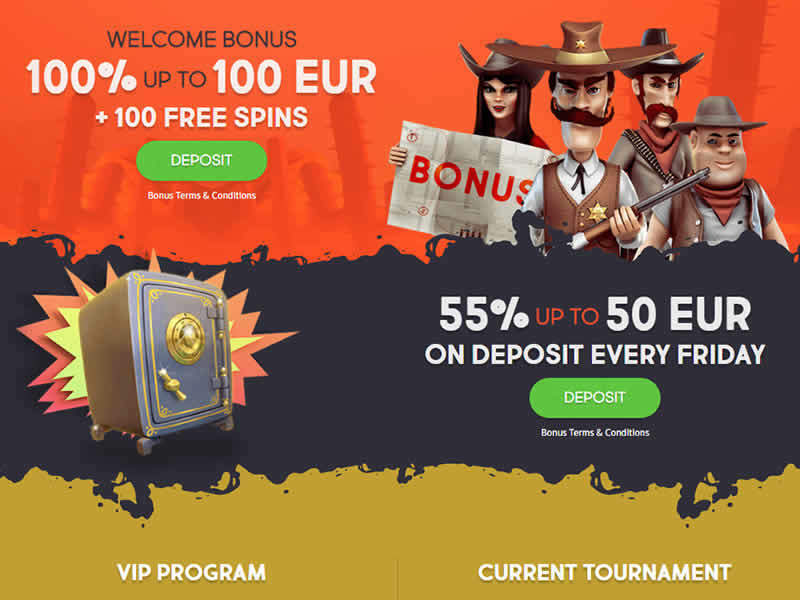 With your first deposit, you can opt for a 100% match bonus up to $/€ 100 + 100 FREE spins. To redeem this offer, you need to make a deposit of $/€ 20 or more. The free spins will then be given within 5 days, 20 per day. Be aware of the wagering requirements: 50X the amount of the bonus + free spin winnings, so make sure you understand how long it will take you to clear this requirement. Every Friday, you can enjoy a 55% match bonus up to $/€ 100 with same wagering requirements. In both cases, there’s a max. cash out rule of $/€ 50 and validity of up to 14 days. Besides that, there’s a VIP program with 7 levels that will award you with different bonuses and perks. You only need to make 1 deposit and get rolling: you will keep earning points while you play. Those points worth real money, and you can exchange them at a better rate when you rank higher. Every new level reached will instantly award you with new special bonuses. Please check Gunsbet promotion terms and conditions for more information. One of the coolest features you will find at Gunsbet casino is the monthly tournament, where you can participate for a $/€ 1,000 prize pool – in real cash and free spins. You join automatically while you play: the more you wager, the more comp points you get and that’s exactly what gets you to the final. Monthly comp points earned. As mentioned previously, there are not many promotions running at Gunsbet. The bonus terms aren’t user friendly either, so I would recommend to participate only in case you want to boost your bankroll, without withdrawals in the short term. We are aware of the current situation in the gambling industry in Australia, where few good casinos are left. Until now, we couldn’t find an online casino offering instant withdrawals. Yes, we found many casino brands “promising fast cash outs” that were not confirmed by player’s feedback. Truth is, most Australian casinos offer withdrawals within 3 business days – and not many processing options. With the advance of Bitcoin, faster processing was made available – moving to 24 hours delay. But still, few Australian casinos accept Bitcoin and not all players have the cryptocurrency to spend gambling online. Gunsbet casino is the first site that accepts Australian players and is still able to offer instant withdrawals with Bitcoin and VISA. I have no idea how they managed to make this possible, but thumbs up! Fast withdrawals are always welcome, specially in complicated markets. We contacted the casino finance department and they confirmed a delay of up to 24 hours – with an average of 2 hours to process a request. Limits are set at AUD 9,500 per week. Needles to say, all your wagers are done in local currency – AUD and you have no restrictions for bonuses or games. The casino site is fully available to Aussie players. 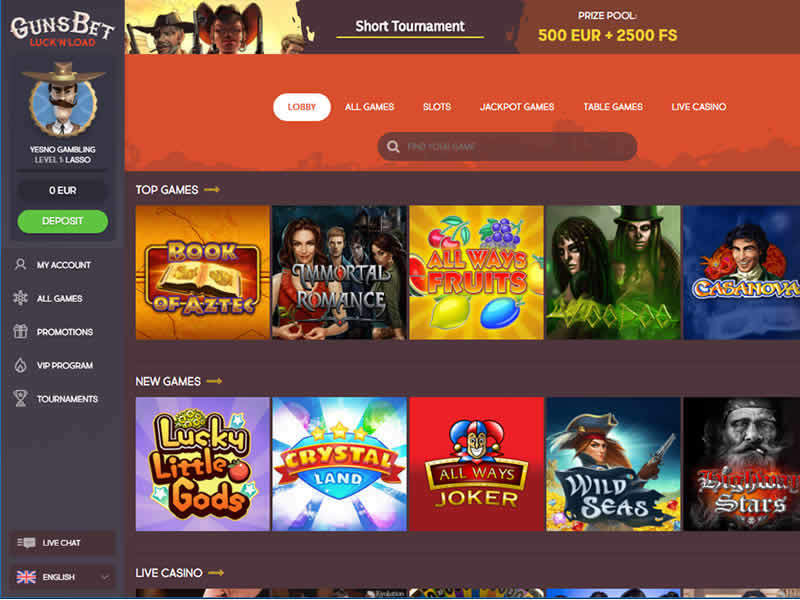 One of the casino strongest points is indeed their gaming platform, powered by by NetEnt, Microgaming, Belatra, Betsoft, EGT, Endorphina, Evolution, Softswiss, Amaya, ELK, Nextgen and Thunderkick. 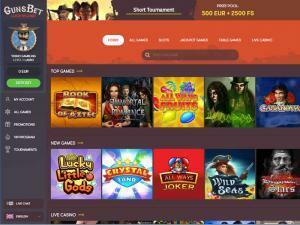 Better known as a multiplatform casino, Gunsbet has all the popular games players are craving for. Here you will find most popular slot machines like Immortal Romance, Starsburst and The Slotfather Part II, between other favourites. If progressives is your thing, you can try your luck at Mega Moolah and Treasure Room. 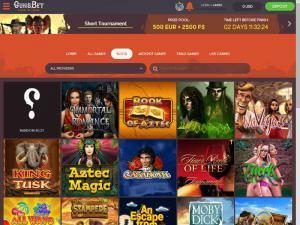 It is not regular to find a casino site offering NetEnt, Microgaming and Betsoft games as well. This somehow makes Gunsbet casino unique – really. You will also find live games and a solid assortment of table games and video poker. Welcome to the Wild West! Gunsbet casino invites you to a new virtual world, right from the sign up page. There, you will have to select a profile character that will follow you during all your casino journey. You can choose between beauty Bonny, fatty Fetty, famous bandit Billy and fearless sheriff. These real cowboys will enhance your game play with additional bonuses while you play and level up. Besides the regular casino games, your character will participate in an adventure like story surrounded by bounty hunters and bandits. The whole platform offers great visuals and attention to the detail. You can fully enjoy this casino from any mobile device. Since the gaming platform was built entirely in instant play – no download required, you can access it using any web browser. Gunsbet is fully optimized to run in Android and iOs devices. The website is available in: English, Russian, German, Swedish, Norwegian, Finnish and Spanish. Gunsbet casino accepts players from Australia and most Europe, except UK, Spain, France and USA. As soon as I entered the site, I understood this is a serious gambling site. The design and attention to detail are enticing, the gamification is really fun and we love their fast processing. Players around the globe will receive their earnings almost instantly, if they use the right payment method. Yes, Australians too! The fact that Gunsbet is able to provide the fastest withdrawals in Australia definitely got my attention. While most Australian online casinos pay in 3 days, Gunsbet manages to do the job in up to 24 hours using VISA or Bitcoin. That’s really impressive, considering all the difficulties brands face while trying to process gambling payments. There aren’t many bonuses available and the terms are not optimal. For either the welcome offer or Friday bonus, you will have a 50X wagering requirement, which can’t be considered player friendly. This casino brand is licensed in Curacao, but is also certified by eCOGRA and IBAS, therefore we can consider it safe and fair. Another positive thing is that you won’t find negative feedback about Gunsbet. Players confirm that this casino pays fast, offers great support and has a good plethora of games. Of course there are many things to improve: we would like to see a phone number listed on website, higher weekly limits and better bonus terms. Still, this casino brand is a great addition to the gambling community, specially for Australians. Gunsbet is without a doubt, one of the most pleasant gambling destinations we reviewed lately. Totally recommendable. Multiple contact methods including live chat. Not available in UK nor USA.